My last quarter of 2010 had very high highs and deep lows. With that came a cut down on blogging, which lead to falling behind on my posts. 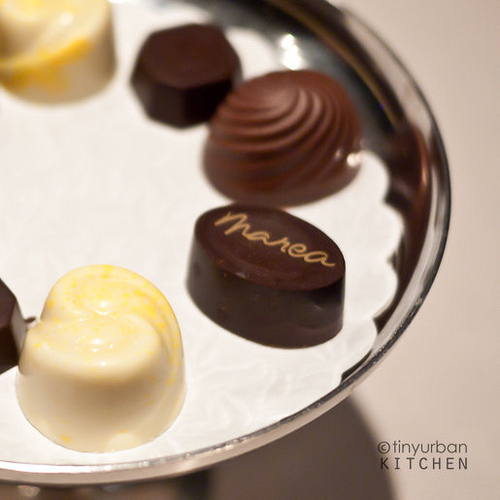 I did a food-retrospect today (through notes + photos) and Marea stood out as one of my best meals of last year. One I’ll definitely want to repeat in 2011. Jen from TinyUrbanKitchen was visiting from Boston. 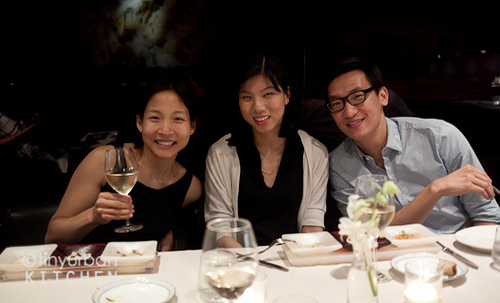 Not only did she organize this dinner with some of my favorite NYC Bloggers, her charm also scored us a complimentary “private room” (usually there’s a $1300 minimum in spending) on a fully booked night. As per Murphy’s law, I remembered charging my batteries, but somehow forgot my camera that night! The good thing about blogger friends is their willingness to share. 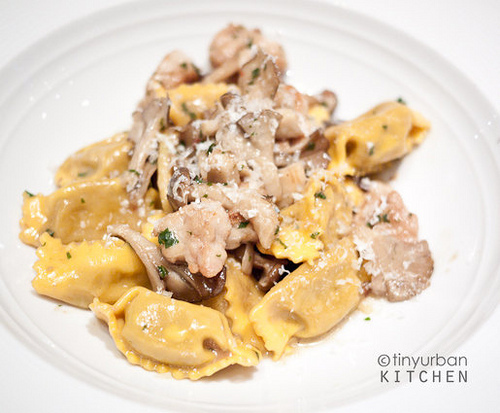 These as you can see were borrowed from TinyUrbanKitchen. Thanks Jen! Her photos are amazing, don’t get too use to them, mine will be back on the next posts *wink*. 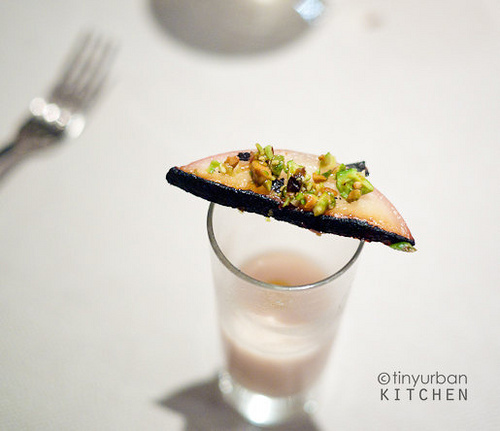 Along with a glass of Kerner (my favorite new white), our amuse bouche came in the form of a melon soup and grilled peach with sprinkles of pistachios. The melon soup was fragrant and lightly salted. Loved the added crunch on the sweet peach. It was like a transition from summer to fall. If I were to die tomorrow and was only allowed one more bite, their RICCI sea urchin, lardo and sea salt would have to be it. (Sorry bacon, pork belly and steak, love you too, but this is on another level). Think of best sea urchin you ever had, magnified 100 times by lardo! Ohhhhhhhhh yesssssss. 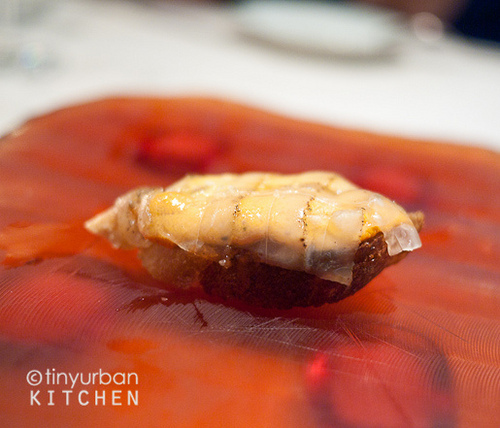 The warm toast holds sweet sea urchin topped with paper thin slices of lardo. It’s creamy, luscius and decadent with that amazing porky flavor I’m so addicted to. Perfectly salty. This is my kind of “surf and turf”. I closed my eyes and smiled, thankful to be alive. This is what eating is about. I would go back just for this. And no sharing. SCAMPI pacific langoustines, murray river pink salt. The meaty and sweet langoustines are delicately prepared, skillfully untouched, with just a tiny pinch of saltiness to bring out its flavor. 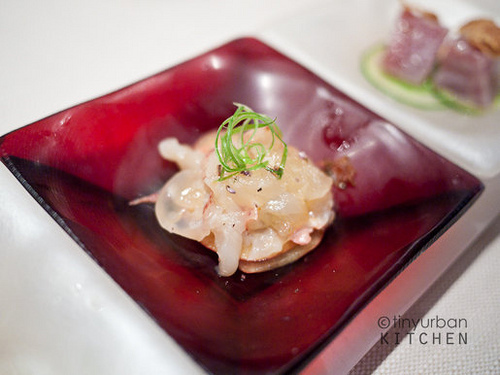 I’m picky about how I like my shrimps and langoustines, but raw or crudo always seems to get my palate’s attention. Maybe it’s the naturally sweetness or that fresh tender meat with a bite and a certain desirable stickiness (in the best way imaginable). 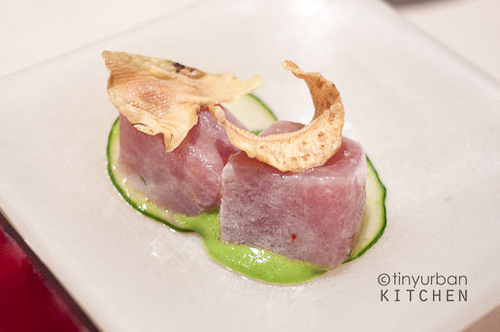 TONNO bigeye tuna, oyster crema, crispy artichokes is a play of textures with the fatty tuna, creamy sauce and the light crunch from the crisps. 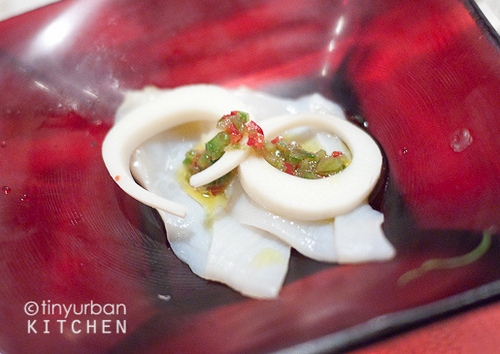 VONGOLE geoduck clam, fresh chilies, lemon and hearts of palm was a splash of the ocean on a tiny plate. I enjoy the slight crunch and chew of the naturally sweet geoduck. If you love that clam-ish flavor, you’ll enjoy this. The citrus brightens it, while the chilies add a little bit of heat and the heart of palm just adds another layer of crunch. I have a soft spot for octopus, plus the waitress highly recommended this POLIPO grilled octopus, smoked potatoes, pickled red onion, chilies, tonnato. It’s meaty, perfectly cooked, not too chewy or mushy. Has a chard to it and a certain smokiness that was so divine and satisfying, everything else on the plate just played backup, in the best way possible. Every bite was a different combination of flavors and textures. The best octopus I’ve ever tasted. SPAGUETTI crab, santa barbara sea urchin, basil was better than Basta Pasta’s. 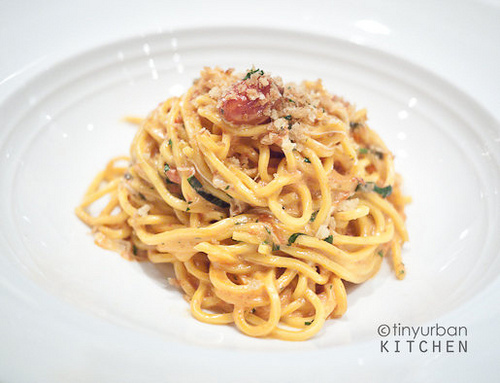 The al dente pasta is lightly tossed in a creamy uni affair, while chunks of sweet crab generously showed up bite after bite. Plus a fresh burst of flavor from the basil in between each roll of the fork. 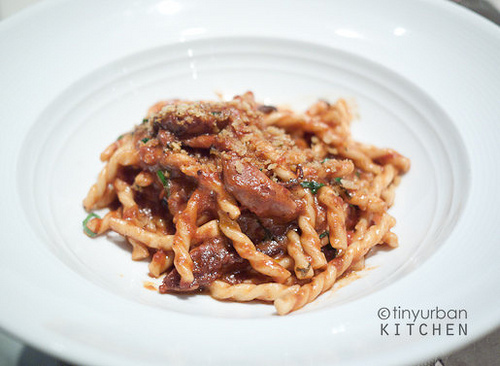 FUSILLI red wine braised octopus, bone marrow is one of their signature dishes. How wild is this? Some of my favorite ingredients in one dish. The fusilli is delightfully chewy and plays nicely with the other components. It has some garlic, some tomato, but most importantly, it’s thick, buttery and melt in your mouth sauce. 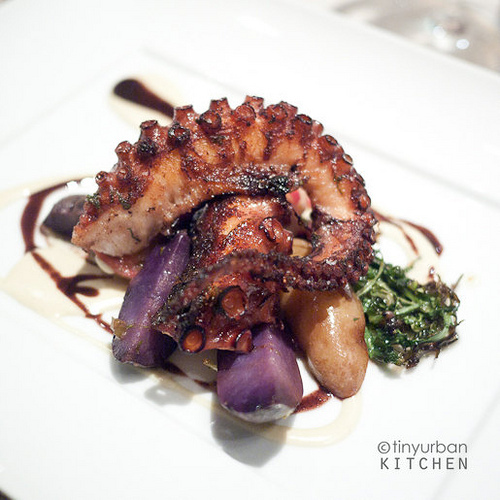 Tender octopus are generously tossed into this plate of heaven. Sea urchin and pasta was always my first choice, but now I really have to reconsider… ok, this has taken top stop on my pasta line up. I’m ready to go back for more. No complaints all around. Fish and pasta were cooked beautifully. I tried bites of each and wished I had a bigger tummy. 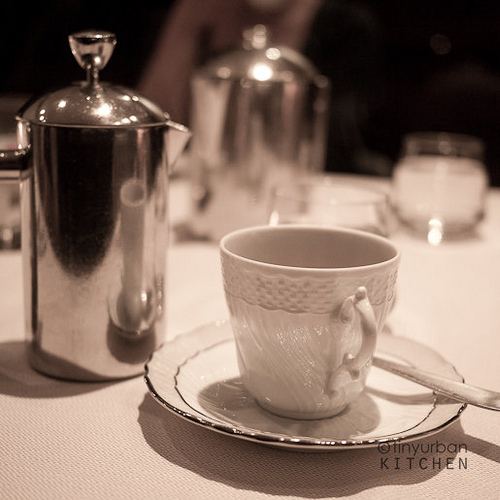 After all the rich dishes, I needed a cup of soothing chamomile to keep going. 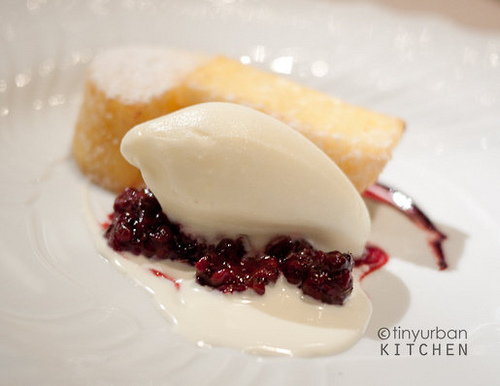 I loved the texture of the POLENTA FRITA, blackberry compote, mascarpone ice cream. It had a little grainy yet moist center. Classically paired with sweet ice cream and tart compote. Another classic combo was the GIANDUJA cocoa nib crema, hazelnut chocolate, fior di latte gelato. 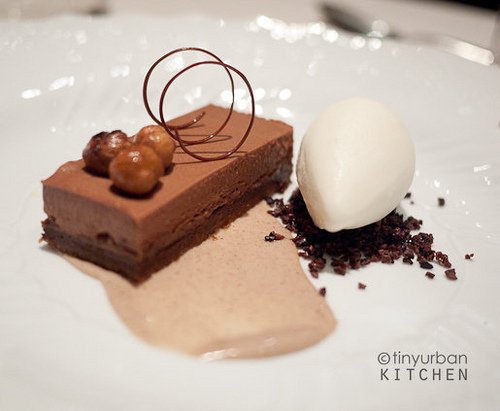 Chocolate, hazelnut and cream gets me every time and this was no exception. 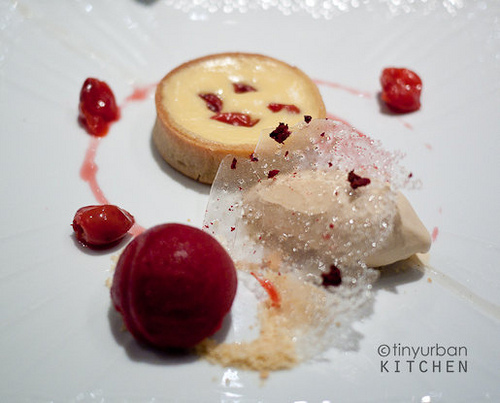 SEMOLINA TART poached local cherries, honey custard brachetto sorbet tasted as beautiful as it looked. It’s was light yet satisfying. The semolina adds a fun and grainy texture. 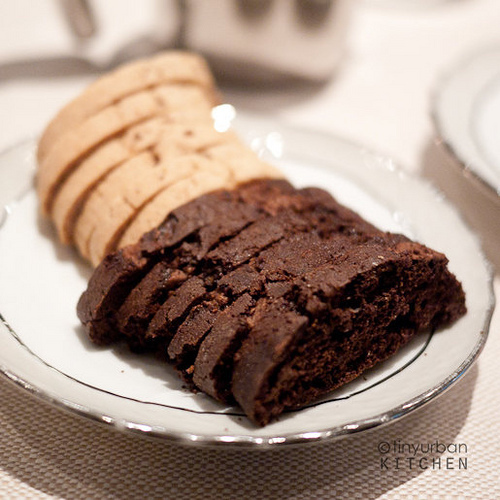 Biscotti was brought for us to share. They were ok, nothing amazing. And of course the night came to an end with an array of Chocolates. 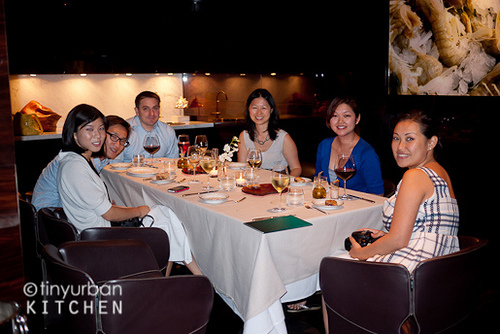 It’s always a lot of fun to eat with fellow food lovers. This amount of over the top food for one night seemed like a sin, a sweet one if you ask me. 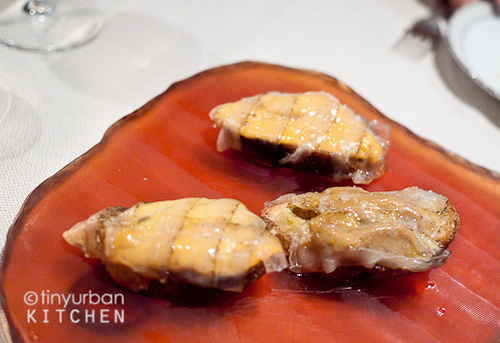 One of my top 3 dinners of 2010, totally deserving of it’s 2 Michelin Stars. I can’t wait to visit and revisit over and over again. Looks amazing. 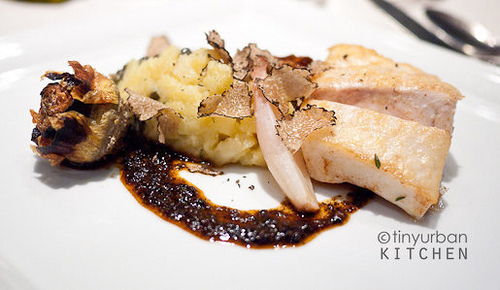 Marea was definitely one of my favorite places in 2010 as well. Oh wow! Jen was there too?! That meal looked awesome! The seafood fest here looked every bit as delicous the photos made out to be. 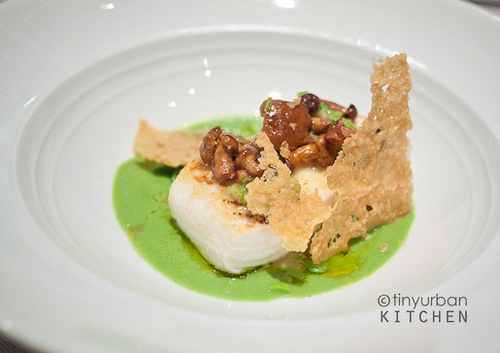 I wish I can tried Michael White's cooking here. I wish I can eat these images. These dishes are really mouth watering.